One of the main reasons I enjoy blogging is because it gives me a chance to post about musicians whose praises may not yet be widely sung. While I certainly like the music of popular/mainstream musicians, most of the time their endeavors receive plenty of ink. As a result, I tend to be more interested in sharing the work of up-and-coming artists. They may not be household names, but the immense pleasure of stumbling across artists whose music excites me is immeasurable. 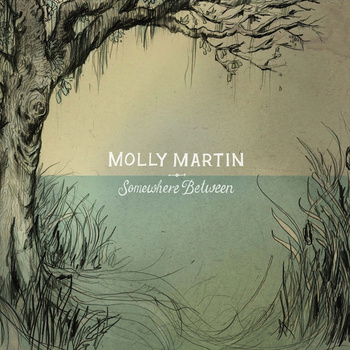 My discovery of the music of Molly Martin was a happy accident that occurred while I was researching another artist. Intriguing singer-songwriters in Nashville always seem to have an equally interesting circle of friends, band members, or tour mates. Mississippi native Martin is no exception, lending her own introspective voice to the deep talent pool. Her recently released debut Somewhere Between is a testament to the power of honest, no-frills songwriting. Martin’s music has a type of unassuming grace, managing to be both elegant and earthy. Lovingly produced by her husband Steve Martin, the blues-tinged folk-country music on Somewhere Between consists of ten astute compositions that are bolstered by an excellent cast of backing musicians and friends. Incorporating humor, empathy, and sensuality, Martin’s songs simmer with laid-back soul. While I’m wary of making comparisons to other artists, I have to agree with those who’ve called her vocals reminiscent of the great Bonnie Raitt. Take a listen to back-to-back album standouts “Lay Me Down” and “Slow Bleed,” tales of couples that need to re-discover their sense of intimacy, and you’ll find that the similarities are striking. Whether playing alongside a band or simply stripped down to her guitar (view the acoustic video clip of “Greyhound” with band member Kai Welch below), Martin’s voice lingers in your memory. Thankfully, Somewhere Between is available for purchase as a permanent keepsake.